ALDEGUND (ALDEGONDE), a sister of St. Waldetrudis (9th April), Abbess of Mons. St. Aldegund was a disciple of St. Amandus of Maestricht (6th February) who also tonsured her into monasticism. She founded the double monastery of Maubeuge Abbey in the County of Hainaut, (present-day northern France), and served as its Abbess until her repose in 684. AMNICHAD (AMNUCHAD), originally either from Ireland or Scotland (sources vary), St. Amnichad emigrated to Fulda Abbey in present-day Germany where he received monastic tonsure, and later lived as a hermit there. St. Amnichad reposed in 1043. ARMENTARIUS, the first Bishop of Antibes in Provence. St. Armentarius reposed circa 451. There seems to be no further information extant on St. Armentarius, though the Gallia Christiana states he was in attendance at the Second Council of Vaison in 442. ARMENTARIUS, Bishop of Pavia in Lombardy from 711 until his repose in 732. No further information on his life is extant as the Acts have either been lost to time or were destroyed. BATHILDIS, an Anglo-Saxon princess or noble who had been sold as a slave to the mayor of the palace of the Kingdom of Burgundy and Neustria. In 649 St. Bathildis was married to King Clovis II and bore his successors, Clothaire III, Childeric II, and Thierry III. Following the death of Clovis II, she served as regent of France until Clotaire III came of age (656–664). Once her sons reached majority, St. Bathildis retired to the Abbey of Our Lady of Chelles (Abbaye Notre-Dame-des-Chelles) where she received monastic tonsure and lived until her repose in 680. 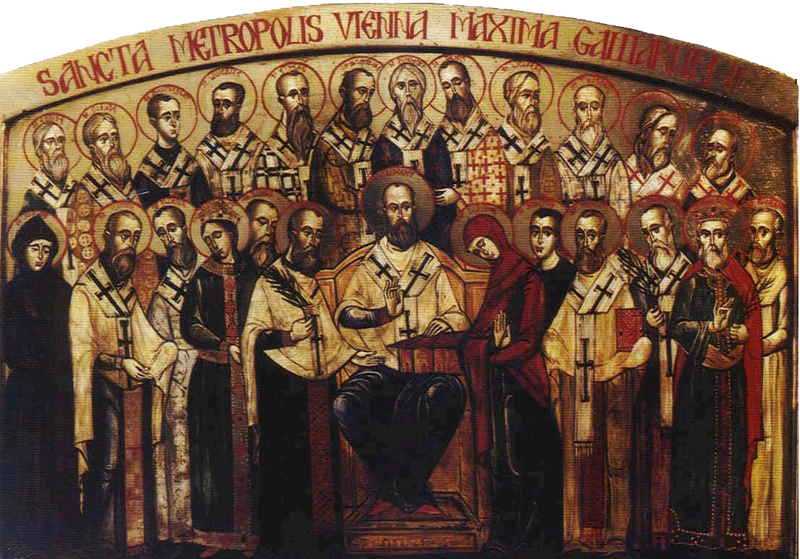 FELICIAN, PHILIPPIAN, and COMPANIONS, (date unknown), a group of one hundred and twenty-six martyrs in North Africa. Though listed in ancient Martyrologies, no information on their lives is extant. MARTINA, (Third Century), a Roman maiden, who was martyred in the early third century; possibly during the reign of Alexander Severus (r. 222–235). SAVINA (SABINA), martyred during the Diocletianic Persecution (311) for aiding and comforting prisoners and arranging proper burials for martyrs. TUDY (TUDCLYD, TYBIE, TYDIE), (Fifth Century), nothing certain is known about this saint other than she was one of the twenty-four children of King St. Brychan of Brycheiniog (6th April). She has left her name to Llandybie in Carmarthenshire in Wales. BENEDICT REVELLI, a monk at Santa Maria dei Fonti in present-day Bari Italy. St. Benedict lived as a hermit on the island of Gallinaria in the Gulf of Genoa for a while before being consecrated Bishop of Albengac in 870. He reposed circa 900. DAMIAN, (Date Unknown), the Bollandists list two St. Damians on this day. The first a soldier martyred in Africa, and the second a martyr in Rome. However, these particulars are speculative at best. ETHELWOLD, a disciple of St. Cuthbert (20th March), St. Ethelwold went on to serve as Abbot of Melrose in Scotland. For the last twenty years of his life, he was Bishop of Lindisfarne. He was a contemporary of St. Bede the Venerable (25th May), who spoke of him with great praise. St. Ethelwold reposed 750 and was initially buried at Lindisfarne, though his relics were later translated to Durham. EULALIA (AULAIRE, AULAZIE, OLALLA) of BARCELONA, a maiden in Barcelona, St. Eulalia was subjected torture and ultimately martyrdom during the Diocletianic Persecution circa 304. GAUDENTIUS of VERONA, a Bishop of Verona, who flourished in the mid-fifth century. No further information on St. Gaudentius is extant. JULIAN the HOSPITALLER, according to tradition, St. Julian accidentally killed his own parents, and in repentance he and his wife went on pilgrimage to Rome. There they built a hospice by the side of a river where they tended to the poor and the sick, and rowed travellers across the river. Present-day scholars are of the opinion that the story of St. Julian is pious fiction, which over time has come to be accepted as fact. MODESTUS of CARTHAGE, martyred at Carthage, Africa Proconsularis circa 160. Nothing further is known about St. Modestus. MODESTUS the DEACON, a deacon martyred during the Diocletianic Persecution circa 304. No further information is extant.